The Sure Shot 500 All in One Combination is an in-ground basketball unit designed for home use. 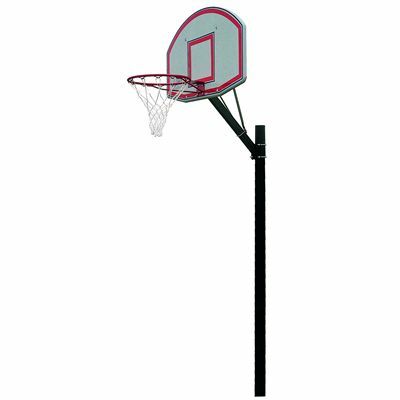 The unit comprises of a durable polypropylene board measuring 44” (111cm) by 28” (71cm), an 18” (45cm) powder coated ring with net and a 3” round steel pole with rigid extension arm. The unit enables easy height adjustment from 8’ (2.44m) to 10’ (3.05m). The Sure Shot 500 All in One Combination must be set in concrete. for submitting product information about Sure Shot 500 All in One Combination We aim to answer all questions within 2-3 days. for submitting product information about Sure Shot 500 All in One Combination. We aim to answer all questions within 2-3 days. If you provided your name and email address, we will email you as soon as the answer is published. for submitting product review about Sure Shot 500 All in One Combination.